Highlights: Cavaliers takes 2-1 advantage over Warriors in 2015 NBA Finals (+Mini-movie) - Balita Boss! 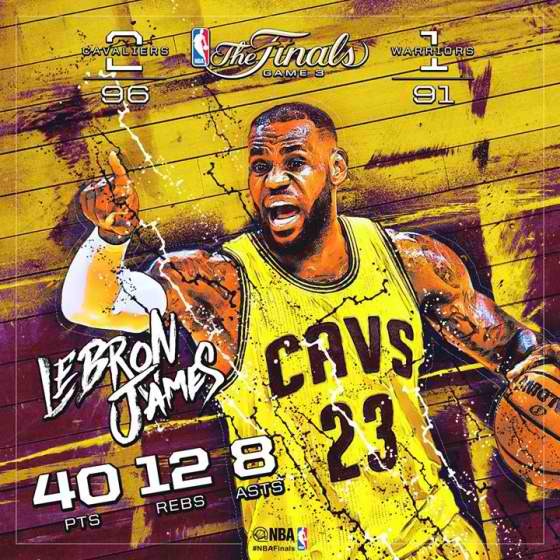 The Cleveland Cavaliers took the third game of the best-of-seven championship series of 2015 NBA Finals against the Golden State Warriors with a 96-91 win on Tuesday night at the Quicken Loans Arena in Cleveland, Ohio. LeBron James with another monster performance led the Cavaliers with 40 points, 12 rebounds, eight assists, four steals, and two blocks. Matthew Dellavedova again played brilliantly, putting up 20 points, five rebounds and four assists, while shutting down Stephen Curry for the large portions of the game. Curry, the reigning MVP, had just three points in the first half, though he still managed to finish the game with 27 points, six rebounds, six assists and three steals. Tristan Thompson contributed 13 rebounds and added 10 points for the Cavs. Andre Iguodala scored 15 points, Klay Thompson had a quiet night with 14 and Lee, who didn't play in Games 1 or 2, had 11 for Warriors.